Day 2 of our family summer trip through the Pacific Northwest had us venturing through the Emerald City. Seattle is a beautiful city. 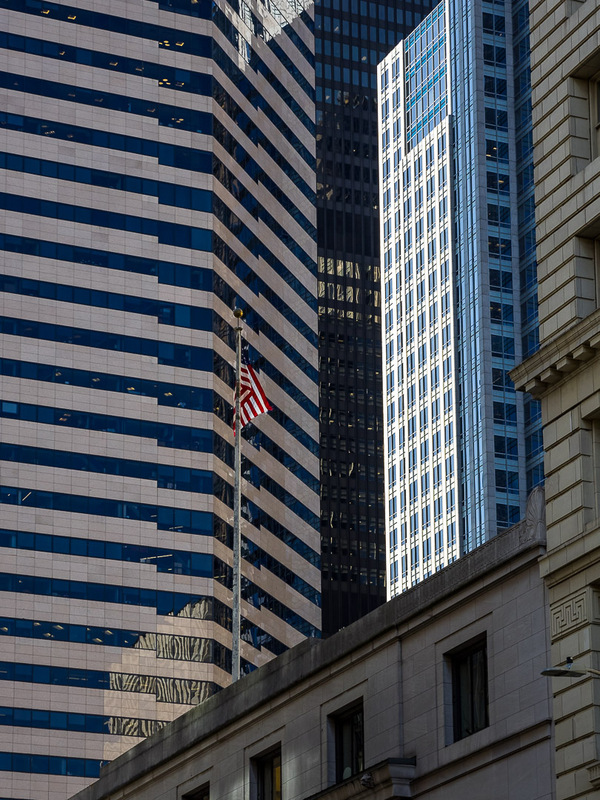 Contrary to popular belief, it is actually a quite sunny city, as also during my fourth visit I was kissed by the sun that brought out Seattle’s amazing colors. But see for yourself after the jump…. 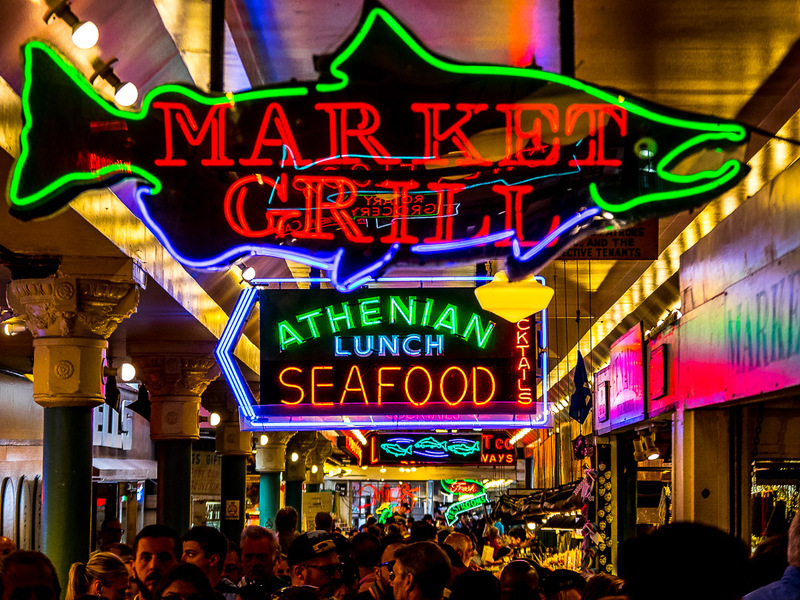 We started out with a visit to famous Pike Place Market, enjoying some fresh food and watching the famous fish vendors from Fishmongers shout orders and toss fish to each other, or even paying customers, a tradition that started more than 30 years ago. 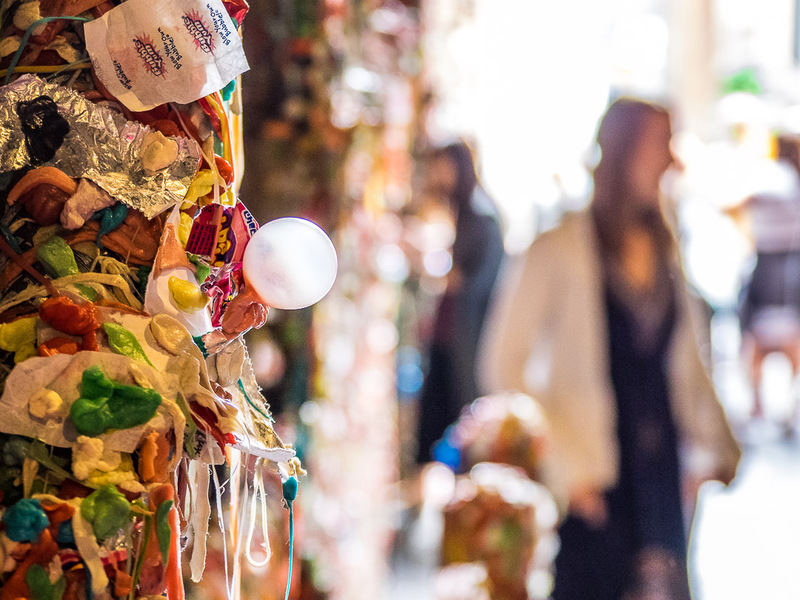 Of course I had to show the kids the infamous Gum Wall in Post Alley, just below the Pike Place Market, about which I have blogged on a previous visit (read here). 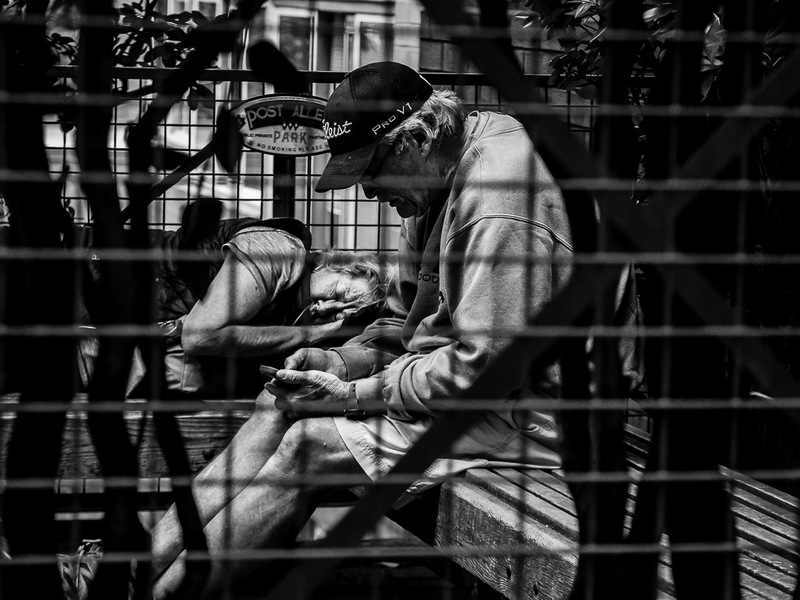 Tiny Post Alley Park offers a place to rest for weary travelers and some street shooting opportunities. 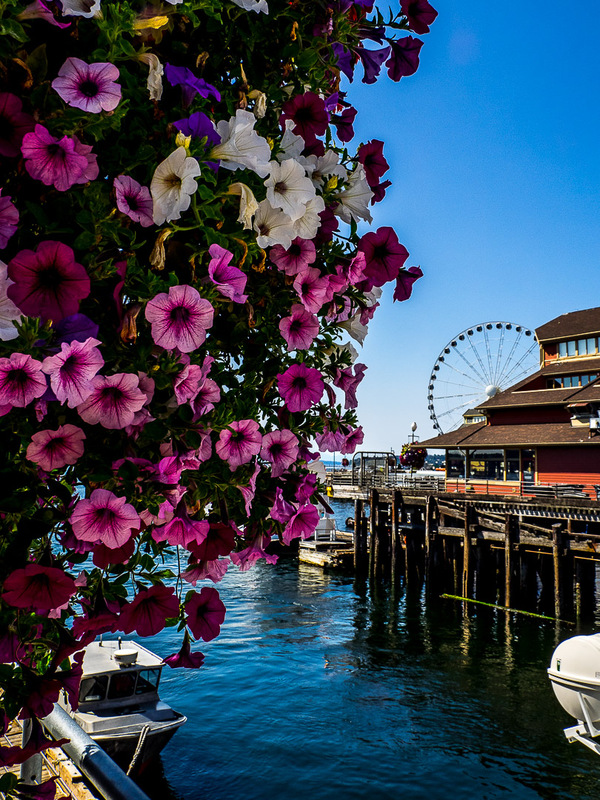 The colorful Seattle Waterfront is a mixed bag. Some parts are nicely re-done, but you always have the two-story highway with plenty of traffic, noise and dirt directly in your back. They are working on a tunnel, but completion is still years away (Bertha the digging machine is not all that fast). 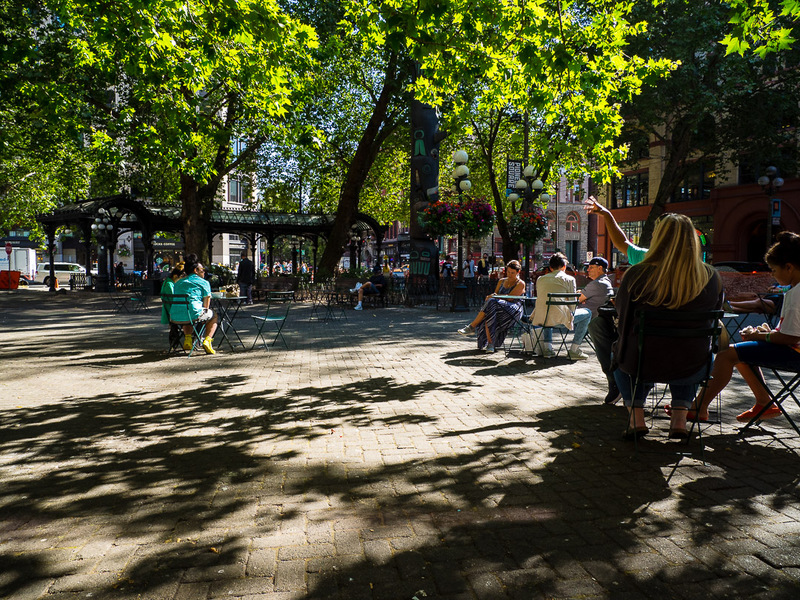 From the waterfront we cut back into the historic old down around Pioneer Square, where Seattle’s founders settled in 1852. Many renovations have taken place and it is actually a quite nice area of the Emerald City. Through the financial district we then headed over to the Expo Center area below the Space Needle. 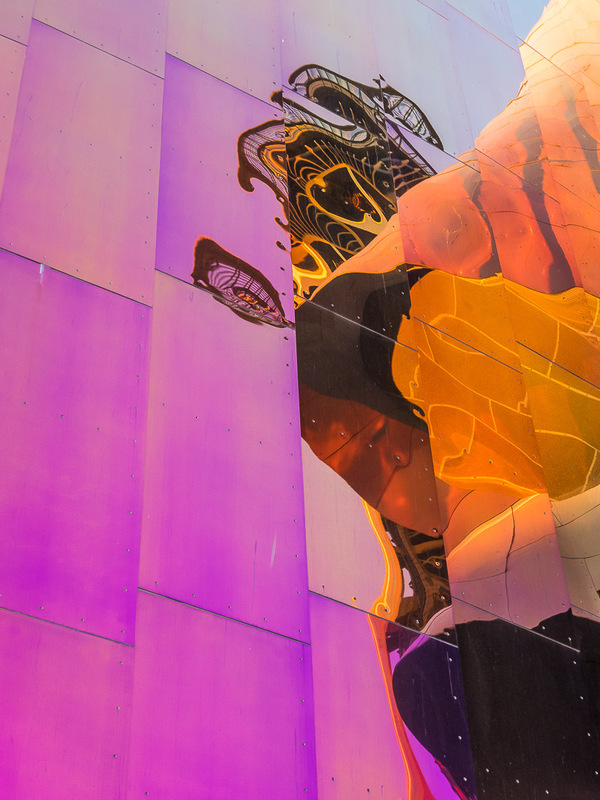 The Expo Center area features the stunning architecture of the MoPop, the Seattle Museum of Modern Pop Culture, that features, among other exhibits, the Science Fiction Hall of Fame. We didn’t go inside, but enjoyed the reflections of its shiny facade, creating the backdrop for a family portrait of another kind. 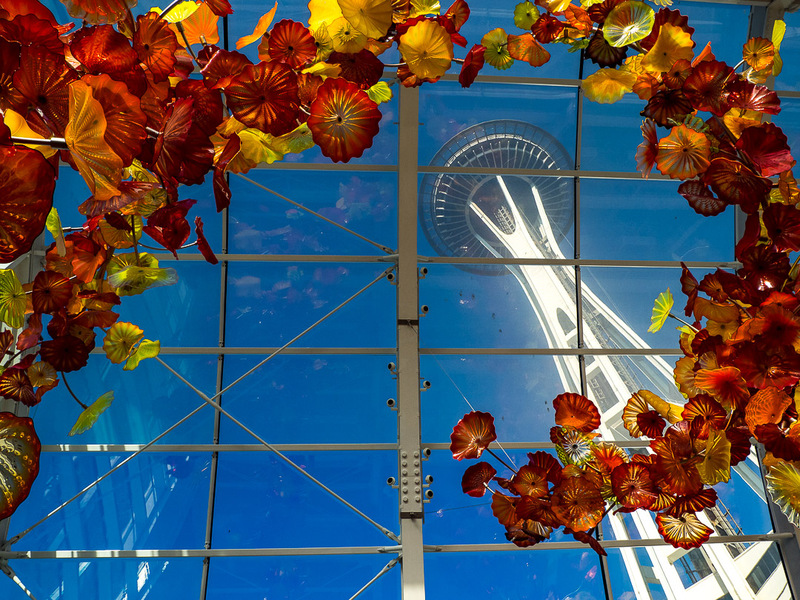 We treated us to a combo ticket for a trip up the iconic Seattle Space Needle and a visit to the fascinating Chihuly Glass and Gardens just down below the tower. 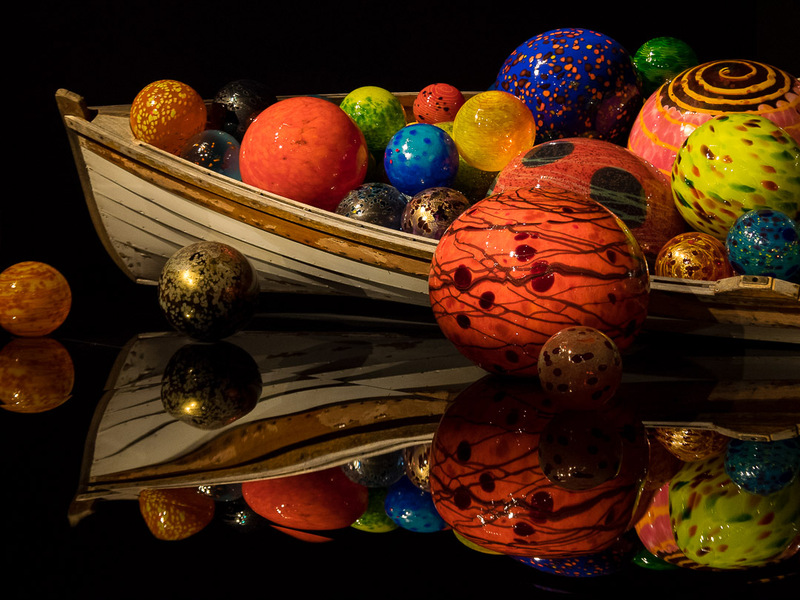 It features the stunning glass art of Tacoma born Dale Chihuly, a true feast for the eye. The view from the Space Needle was spectacular, and we even got treated to our first view of volcano Mount Rainier in the distance (you can make it out just behind the stadiums). 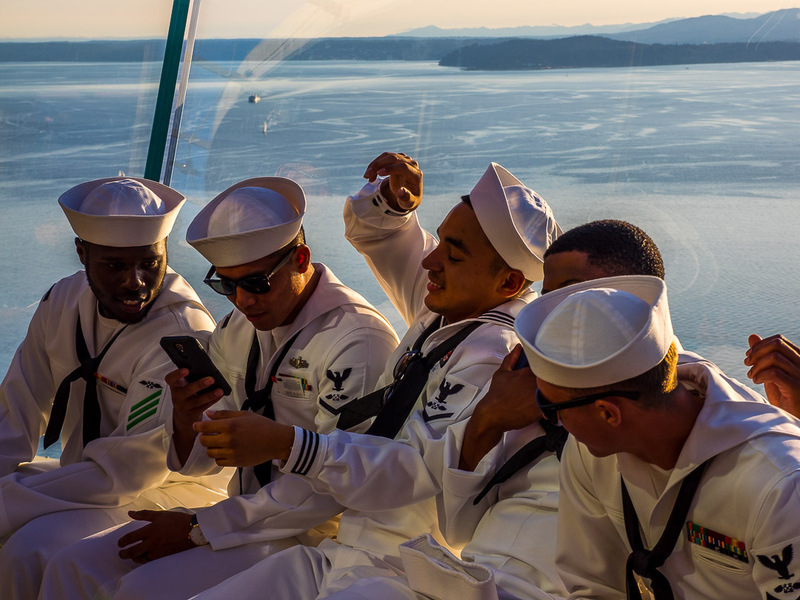 A pity was that the construction on the Space Needle platform is still not completed, we couldn’t walk completely around and also the coming glass floor on the lower level is not yet accessible. Walking back to the car (parked for free five blocks north of the Expo Center) we were treated to some more colorful views of the Space Needle in the setting sun. 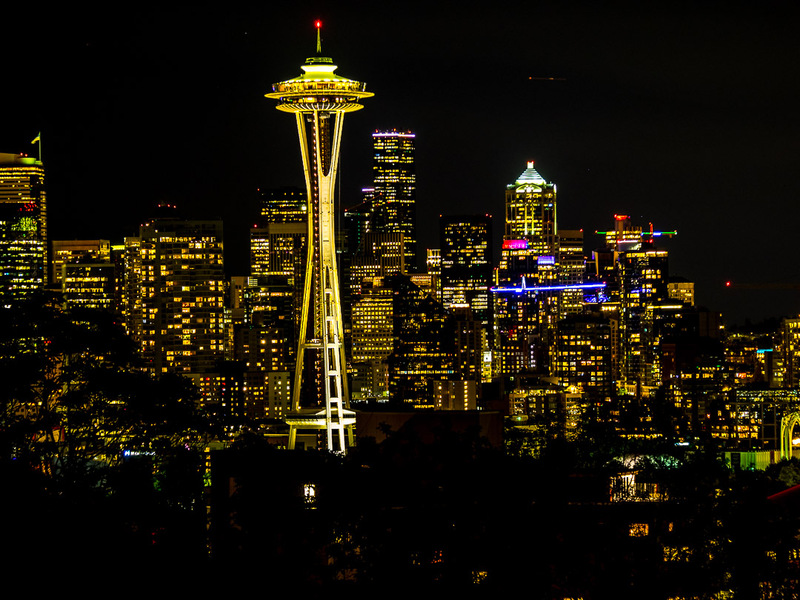 After an extensive Pizza dinner we finished our day in Seattle with a trip up to Kerry Park in Queen Anne, were I set up the tripod for a long exposure night shot of the skyline below. Also Big Girl, who is a big fan of Grey’s Anatomy, paid a visit to Meredith’s (film-) house, which is just around the corner from Kerry Park. I had previously blogged about the views from Kerry Park here and here. 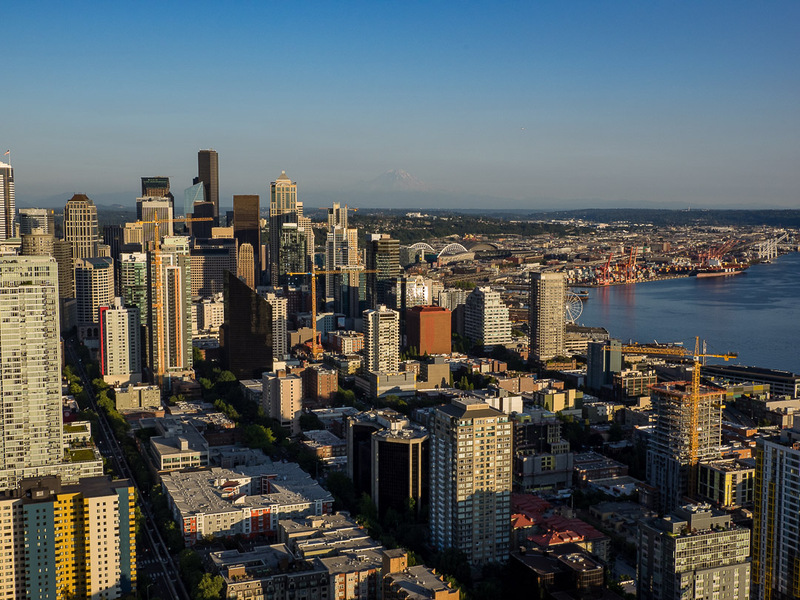 All in all, for one day Seattle visitors, our program should give you a good starting point for your own visit to the Emerald City. Gear-wise, I left my PEN-F and the 12-40 and 40-150 in our Air BnB and just carried the E-M1 with the 12-100 F/4, my proven preferred combo for versatile city shooting. Btw, Bertha the tunnel boring machine finished quite a while ago…the tunnel that is replacing the ugly viaduct is scheduled to open in Jan./Feb. 2019. Bertha actually tunneled fairly quickly, once the initial big problem got sorted…it took two years to construct a “rescue pit,” lift the cutter head, etc. to the ground surface, replace the main bearing and add extra steel to reinforce/stiffen the cutter head, lower the cutter head back into the rescue pit/tunnel, and put it all back together and restart 🙂 Mostly smooth progress from then on. Sehr witzig, bin heute auf dein Blog gestolpert…ich heisse Markus und wohne in Seattle (Fremont), meine Mutter wohnt in der Naehe von Nuernberg. best shot i’ve seen of that needle thing. Love this post! 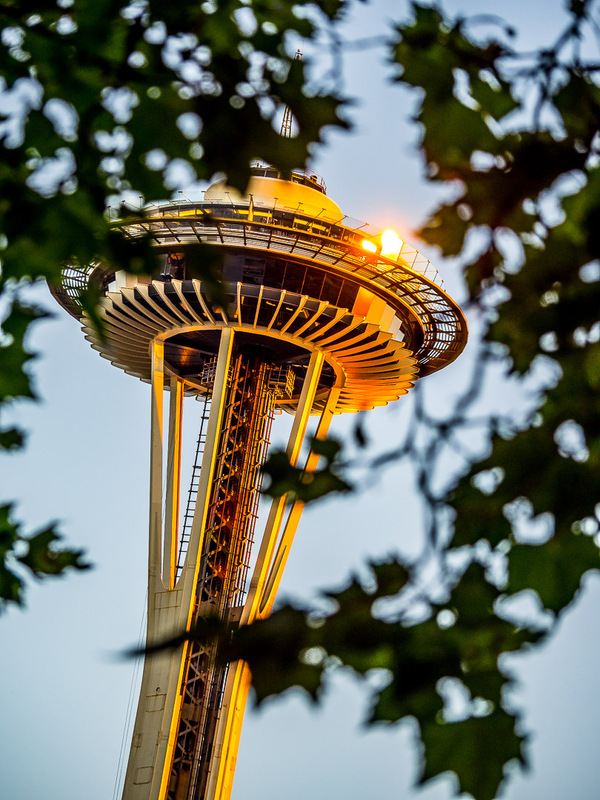 I’m originally from Seattle and you’ve done a fabulous job showcasing the city! I was just there and loved exploring the Georgetown area, have you been? 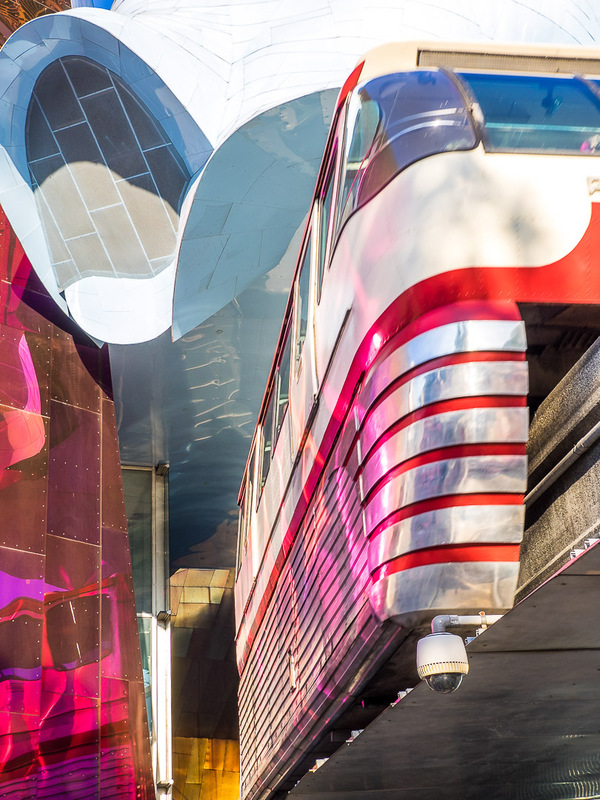 Quirky and fun, Seattle’s oldest neighborhood… or so they say. They maybe on shore duty at the U.S. Naval Base Bremerton on board one of the carriers based there. Glad you found it interesting, Tim. We saw a Carrier moored in Bremerton when heading to the Olympic Peninsula. Marcus, I did. Thank you for sharing it. 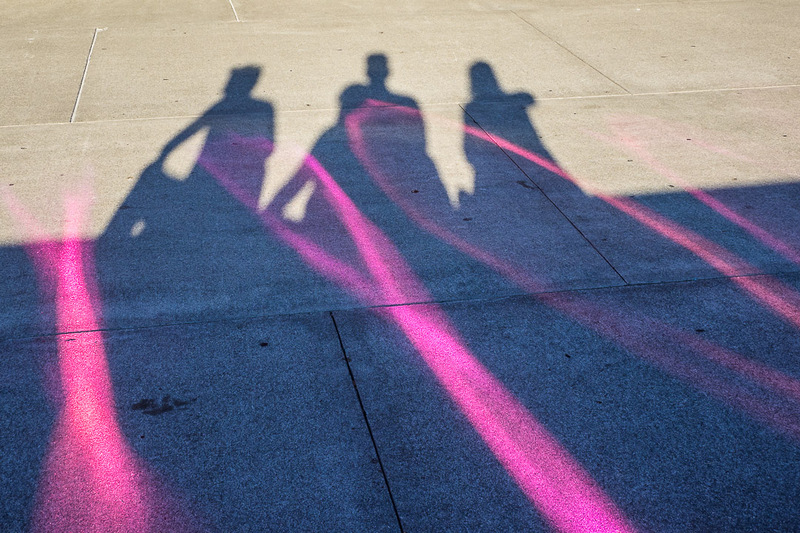 Marcus, I love the different and creative perspective of Seattle, unusual images. I love the color. Thanks. Gorgeous photos, Marcos. I have never been….now I really want to go there! Stunning. I’ve been to Seattle one time and loved it. Thanks so much, highly appreciated! Who wouldn’t love Seattle 😉? The PNW feels “old,” in general. So places like Seattle and Portland exude a gravitas which exceeds their actual age. 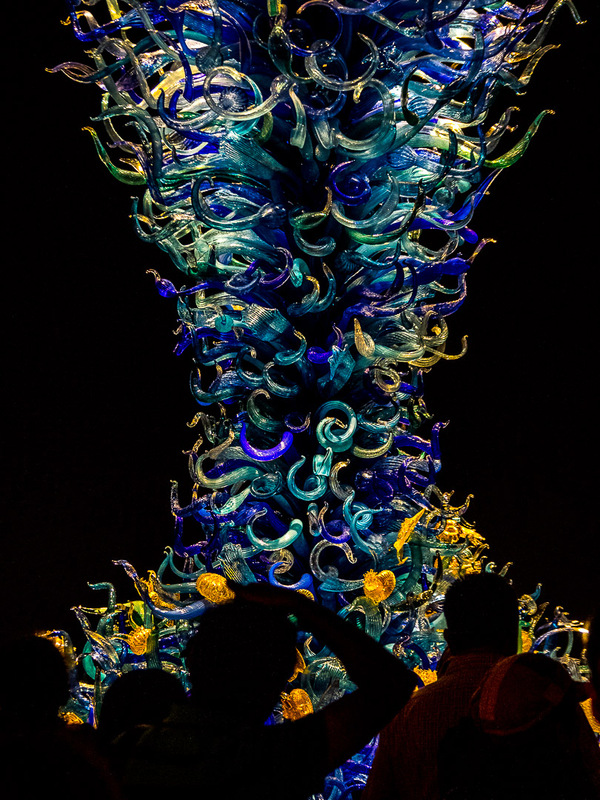 Stunning shots of the Space Needle Marcus. So pleased the sun is shining for your holiday! Nice photography. Seattle is looking good. Have a fab holiday. Great photos and narrative. Sounds like a wonderful city. Love your shots as always!! Great post. Great pictures. I like the lighting on the sailor photograph. Absolutely beautiful series! The light and composition in these shots are stunning!